2 seconds – fu#¤ed or in love!? | So what's up?! Tech & digital comms. 2 seconds – fu#¤ed or in love!? I got some book recommendations – thanx to Anne G.! 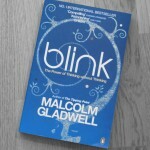 I have started on “Blink” by Malcom Gladwell. This is a book about those moments when we “know” something without knowing why. This book shows how a snap judgement can be far more effective than cautious decisions, according to Gladwell. Another book recommendation? Try “Free” by Chris Anderson. It’s great!